This weekend has been a rather special one - yesterday marked 20 years to the day that I said "I do" to probably the most patient woman in the world! We have had a really lovely weekend and had a fabulous dinner, bed and breakfast stay at the Michelin starred Fischer's restaurant at Baslow Hall, Derbyshire. Just to prove how great a wife she is (I did tell the whole world and her on Facebook! ), she was still happy for me to sit down and write another blog post for you all - I think, however, that it probably should be a short one! I don't want to test her patience too much! 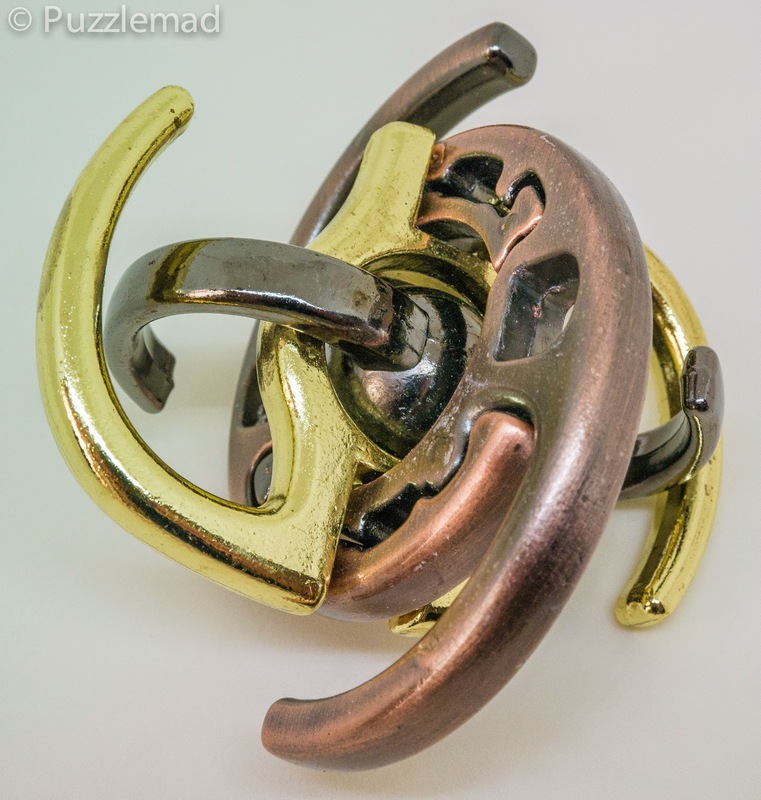 This quick post is a review of the EZ Galaxy from the Puzzle Master metal puzzle selection. I actually used another puzzle from this series back April when I also needed to write a short post and this will be similar. It is a very pretty shiny design by Doug Engel and is made of three colours of metal - brushed bronze, gold and gunmetal alloy, with the inner gunmetal piece taking the shape of a spiral galaxy. The goal is to take all four pieces apart and free the dark colored galaxy and then, of course, to reunite them afterwards. It is spherical in overal shape and 8.9cm across and extremely jingly! The rating from Puzzle Master is 8 on their scale of 5-10. This should be significantly tougher than the EZ Atom which was rated a 6. There have been 2 reviews on the product page which have been generally positive and averaged at 4/5. No solution is provided but if you need it (which I very much doubt) then it can be downloaded from here. Having gotten back from our big day away, I take this out telling 'she who must be obeyed' that I would pick a quick easy one to solve and review. She snorted in disbelief but let me get on with it. Her only comment was that it was nice and shiny! Having taken my initial photos, I sat down and jingled a bit trying to gain an idea for what would happen and quickly realised that this thing is very very loose indeed! It seems to almost want to fall to bits but seems not to quite do so. The central ball is the piece that seems to block everything and whilst it can all move to extreme separation, it cannot fall apart. The whole solution must have taken me all of 2 minutes which was a little disappointing but I sort of realised that as usual I had not been paying adequate attention and only had a vague idea of how to put it together. Reassembly probably took me another 5 minutes and I think I did struggle a little. Overall I would put the difficulty level here as a 6 (exactly the same as the EZ Atom). 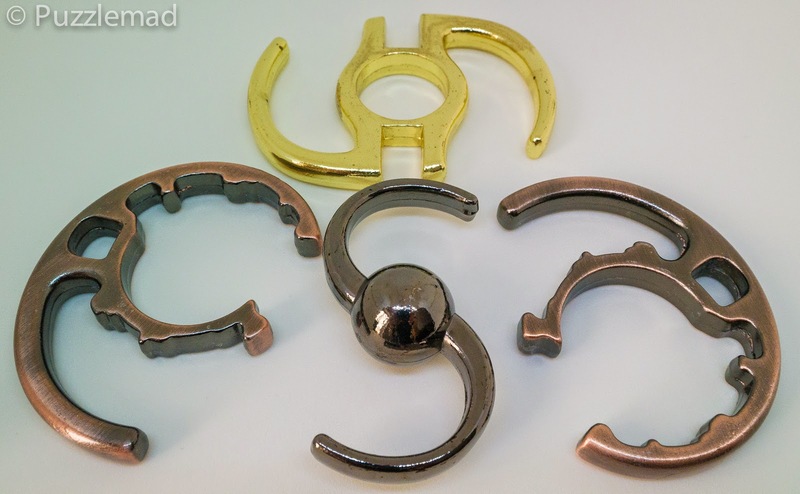 This would not challenge a serious puzzler but is probably quite nice for a newcomer to puzzles or a child. As I was sitting drinking a cuppa, I played with it idly and must say it makes a very nice shiny worry bead. After a bit of playing I discovered the EXACT movement that it required to disassemble and reassemble it. It doesn't have to just fall apart it can be taken apart very precisely. This does increase my rating - on Puzzle Master's page I would probably give it a 3-4/5. At $16 this is not going to break the bank and is a nice one for the shelf or collection - I think I will aim to get the rest in the series soon. A great discovery.......or Shane does it again! Packing puzzles I can do....Almost!